Back (l-r): Sisters Laura Jean Spaeth, Susan Jordan, Kathleen Bauer. The Provincial Council is the leadership team of the Central Pacific Province. We prayerfully discern and elect Sisters to serve on the council, which provides governance, planning, spiritual guidance and day-to-day leadership of the sisters who make up the province. The current provincial council was installed in June of 2015 and will serve until June 2019. 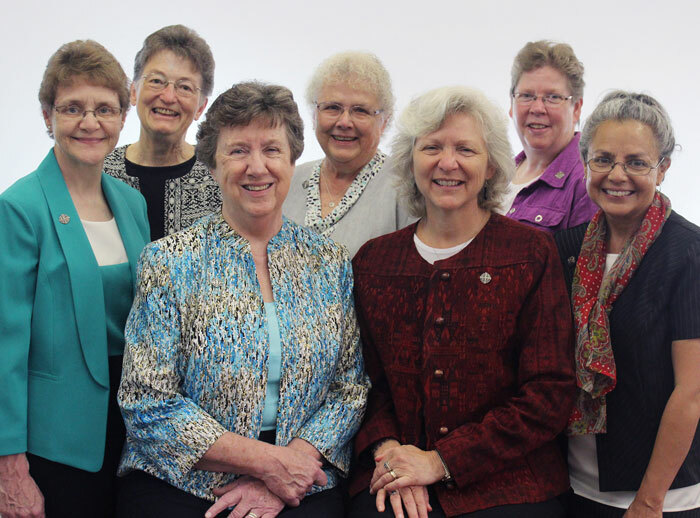 The provincial council's work flows from the shared life and mission of the sisters of the province, and it is an honor to serve in this way. Sister Mary Anne Owens was born in New York City to immigrant parents. She professed vows in 1965, after which she taught junior high in Maryland and high school in Pennsylvania. From 1973-1978 she served in elementary administration in Dallas and Fort Worth, Texas. Beginning in 1978, she directed the Justice and Peace office for the Diocese of Lafayette, Louisiana. Returning to Dallas in 1985, Sister Mary Anne served on the provincial council for eight years in the former Dallas Province. 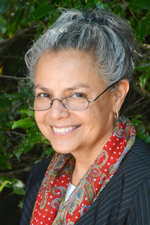 In 1994, she became director of a Family Service Center in Dallas; this ministry was followed by working for Catholic Charities in Long Island, New York, for two years before finally returning to Dallas to become Director of Catholic Charities from 1998 to June 2011. She was then elected Provincial Leader of the newly formed Central Pacific Province, a position she currently serves. Sister Mary Anne earned a Bachelor’s degree in history and social studies from Marywood College in Scranton, Pennsylvania, in 1967 and a Master’s degree in geography and administration from Ball State University in Muncie, Indiana, in 1974. In 1993, she earned a certificate in gerontology from North Texas University in Denton, Texas. Sister Kathleen Bauer was born in Robinsdale, Minnesota. She professed first vows as a School Sister of Notre Dame in 1978 in Mankato, Minnesota, and for 25 years, she was a physical therapist. From 1999 to 2012, she worked for Allina Health and managed various departments at New Ulm Medical Center in New Ulm, Minnesota. Most recently, she served as information services site manager for Abbott Hospital in Minneapolis. 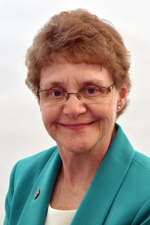 Sister Kathleen earned a bachelor’s in open studies in 1980 and a bachelor’s in physical therapy in 1982 from Mayo Clinic and Mankato State University in Minnesota, and an MBA with a focus in healthcare management and finance from the University of St. Thomas in St. Paul in 1995. Sister Christine Garcia was born in San Antonio. She professed first vows as a School Sister of Notre Dame in 1978 in Dallas and served as a teacher for 14 years in Dallas, San Antonio and Rio Grande, Texas. Sister Christine served as principal at Immaculate Conception in Rio Grande from 1991-97. From 1998 through 2000, she was in discernment and preparation for SSND ministry in Pakistan, and at the same time, served as transportation coordinator at St. Mary of the Pines in Chatawa, Mississippi. For five years, she served as vocation ministry director for the former Dallas Province before working as an administrative assistant in the Office of Religious Education for Children in the Diocese of Laredo. From 2010 to 2015, she served the migrant community as a volunteer with the SSND border ministry in Douglas, Arizona. Sister Christine earned a bachelor’s in elementary education from St. Mary’s University in San Antonio in 1976 and a master’s in Catholic school administration and supervision from Boston College in Massachusetts in 1991. Sister Susan Jordan was born in St. Louis. She professed first vows as a School Sister of Notre Dame in 1963 in St. Louis, and served as a teacher for 15 years in St. Louis at Rosary, Labouré and Kennedy high schools. From 1981 until 2007, she was the coordinator for the Midwest Coalition for Responsible Investment a faith-based regional organization that collaborates with like groups and the national Interfaith Center on Corporate Responsibility to use the power of investments to influence corporate policies related to justice issues. She simultaneously served the School Sisters of Notre Dame as a social responsibility resource person. 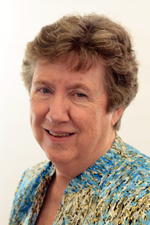 Sister Susan began leadership as a provincial councilor for the former St. Louis Province, 2007-11, and the Central Pacific Province 2011 to present. She earned her bachelor’s in Latin with a minor in French from the former Notre Dame College in St. Louis in 1965, and a master’s in education with a concentration in French from Southern Illinois University-Edwardsville in 1973. Sister Marjorie Klein was born in Willmar, Minnesota. 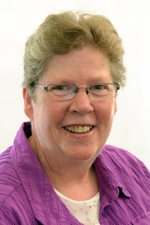 She professed first vows as a School Sister of Notre Dame in 1978 in Mankato, Minnesota. She served as a teacher for nine years in Minnesota at Corpus Christi in St. Paul, Holy Rosary in North Mankato, St. Mary in Tracy and St. Mary in New Ulm. From 1988 to 2000, she served in administrative roles in Minnesota at the Center for Spiritual Development in Bird Island, followed by several years as a staff member for the Villa Maria Center in Frontenac and Christ the King Retreat Center in Buffalo. From 2005 until 2009, she was the director of formation for the former Mankato Province. She then served as provincial leader for the former Mankato Province from 2009 to 2011, and has served as a provincial councilor for the Central Pacific Province from 2011 to present. Sister Marjorie earned a bachelor’s in elementary education from the College of St. Catherine in Minneapolis/St. Paul, in 1978 and a master’s in pastoral studies from Loyola University of Chicago in 1989. Sister Anna Marie Reha was born in Iowa City, Iowa. She professed first vows as a School Sister of Notre Dame in Mankato, Minnesota, in 1983. She served as a teacher at St. Matthew in St. Paul from 1984 until 1991. For ten years, she was the parish administrator and worked in pastoral ministry at San Sebastian in San Marcos, Guatemala. Sister Anna Marie was the vocations director in Guatemala for the former Mankato Province, from 1994 to 1998. From 2005 to 2015, she served as the director of Hispanic ministry for the Diocese of New Ulm in Minnesota, and began her role as provincial councilor in 2015. Sister Anna Marie earned a bachelor’s in elementary education from Mankato State University in Minnesota in 1984 and a master’s of divinity from Oblate School of Theology in San Antonio in 2005. Sister Laura Jean Spaeth was born on a farm near West Bend, Wisconsin, as the ninth of 12 children. In 1963, she professed first vows as a School Sister of Notre Dame in Mequon, Wisconsin. She taught at a rural three-room school at St. John Baptist in Cook’s Valley near Bloomer, Wisconsin, and a large inner city school at St. Leo in Milwaukee. She was also a principal and teacher at St. Francis Xavier in Superior, Wisconsin. 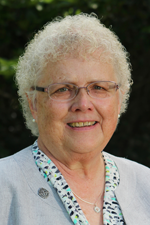 Her other ministries have included serving in justice and peace education as the SSND staff person and administrator of a seven-religious-community collaborative center from 1976 to 1979; and being the parish RENEW program coordinator at St. Anne in Milwaukee from 1980 to 1982. Sister Laura Jean was then called to the international congregation in Rome to serve as a resource staff person for our SSND global peace and justice mission from 1982 to 1985. After this service, from 1986 to 1991, she was the founding director of the Wellspring Renewal Program for men and women religious in Glen Falls, New York. 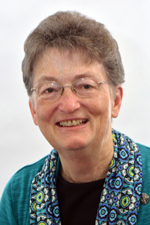 Sister Laura Jean was elected to serve as provincial leader of the former Milwaukee Province from 1991 to 1997, and was then called to continue in leadership, being elected for two five-year terms as a general councilor to serve the international congregation based in Rome from 1998 to 2008. 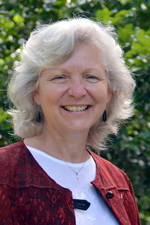 Upon return to the United States, Sister Laura Jean served in Missouri as campus minister of the Newman Center in Rolla from 2009 to 2012 and as spiritual director, she also served as leader of various retreats and facilitator within the Diocese of Jefferson City from 2012 to 2015. In 2011, she was again called to leadership as provincial councilor, her current ministry. Sister Laura Jean earned a bachelor’s in sociology from Mount Mary University in Milwaukee in 1969, a master’s in theology with a concentration in scripture from St. John’s University in Collegeville, Minnesota, in 1980, and a second master’s in spiritual studies and spirituality from Regis College in Ontario, Canada, in 1980.